Increasing Second Pair Sales: Don’t sell. Educate! Opticians, how many pair of glasses do you have? I have twelve pair of glasses that I frequently wear, and I bet most you are somewhere close to that. 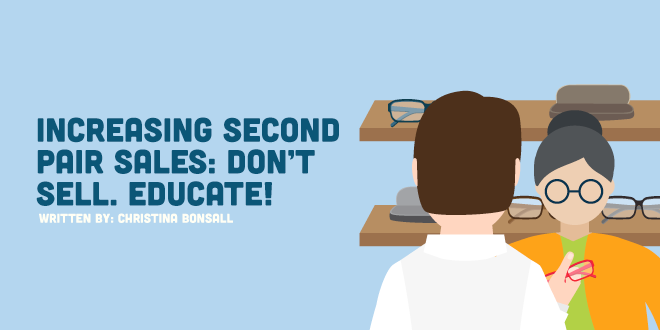 The reason I ask is to pose the question: if we can convince ourselves that we need twelve pair of glasses, how is it that we can not convince our patients that they need two? Our patients entrust us with the health of their eyes and quality of their vision, yet somehow we convince ourselves we are doing them a favor by only offering them one pair of glasses. Frankly, that is a failure on our part. There is simply no way that a single pair of glasses can provide excellent vision to a person at all times. At the very least, we owe it to our patients to tell them that. If you saw a sales associate offer a mom with twin toddlers a pair of stilettos heels to take the kids to the park, what would you think? Ridiculous, right? Yet, optometrists and opticians will offer an engineer a progressive lens and expect a tech industry patient to be pleased by how she sees her computer for twelve hours a day. Equally ridiculous? Absolutely! Just like mom needs sneakers, that engineer needs some computer glasses! The key to overcoming this hurdle is to change our mindset from selling to educating. Just talk to your patients about the options available. What’s the worst that can happen? They still walk out with one pair. But even if that’s the case, you’ve still planted a seed of interest, and if they don’t buy that second pair today, they may next week, next month, or next year. Many patients don’t even know the options available to them in eyewear, so tell them as often as you possibly can. Second pair sales start with the receptionist during the appointment confirmation. Mr. Jones might not have any of those, but I bet it got him thinking. Here’s where the clinic technician takes over the second pair sales process. When Mr. Jones arrives for his exam, the clinic technician should take a look at each of his pairs of glasses and be sure to ask him some lifestyle questions. He might benefit from a pair of shooting glasses. He might benefit from a pair of computer glasses. He might benefit from polarized sunglasses. Another good question that is less specific is, “Is there anything you don’t like about your current eyewear?” You’ll learn a lot about the needs and wants of your patients with this one question. Don’t forget to write it all down! In our office, we have a special sheet used just for this purpose, so later, the doctor can use the patient’s own words to tell the patient why he is prescribing multiple pairs of glasses. 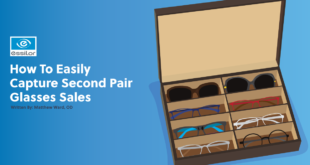 The optometrist adds legitimacy to the second pair sales process. At this point, our doctor actually prescribes these glasses on a visual solution sheet, and some doctors even use an actual RX pad. Again, the doctor prescribes the sunglasses on a visual solution sheet. The doctor then notes on the chart for the receptionist to offer to schedule his shooting consultation at the end of Mr. Jones’ visit. Lastly, the opticians must seal the deal. Once the doctor has passed the baton and we opticians take over, we must, MUST, continue to talk about each of the pair of glasses the doctor prescribed, and remind the patient of the features and benefits of each of them. Focus on how they will each improve the quality of the patient’s life, the clinical need for them, the convenience they will provide. Even if the patient doesn’t want to buy them all today, you’ve done your job to educate them, and more often than not, they will purchase them at some point. Be sure, at the very least, to send them home with quotes on every pair of glasses prescribed, including the retail cost and the patient’s final cost with any discounts applied. When choosing frames, make sure the patient chooses one with each pair of glasses in mind. Drop subtle hints to remind the patient that they are shopping for multiple pairs of glasses. And voila, two pairs sold that day, and a third recorded for the future. 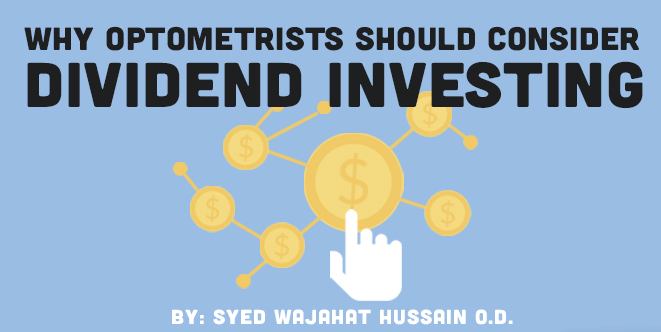 If you do this right, placing a need on each pair of glasses, the patient might happily pay full price for each pair, and for this reason, some offices don’t offer a discount on multiple pairs. That has to be up to your and your office. If you wish to provide some incentives, there are many ways to encourage the patient not to pass up that second or third or fourth pair. Don’t forget how powerful financial incentives can be, when it comes to second pair sales. If you can, offer 50% off any additional pair of glasses when they are purchased within 30 days of the first pair. (Ask your lab if they offer multiple pair discounts to help offset the cost.) If the patient doesn’t buy them that day, hand them a 50% off coupon when you dispense their eyewear and remind them they have another couple weeks to use it. Each year during the holiday season, offer a special savings on additional pairs of glasses to patients who have purchased eyewear throughout that year. Each Spring, have a sunglasses trunk show, and offer savings on prescription and non-prescription sunglasses. During computer vision month, offer a discount on computer glasses. During sports vision month, offer a discount of sports goggles. The possibilities are endless! No matter what you do, the key is to remember that it’s our job to educate each patient on what is best for their eye health and vision. You are helping the patient by providing them with the best and safest eyewear for everything they do. And if you don’t tell them, how will they know? Want to know more? Check out the following links for ABO & COPE Accredited webinars that relate to this topic. With over ten years of marketing, public relations, and sales experience in the beauty industry, Christina joined VisionArts Eyecare Center in Fulton, MO as the marketing coordinator and an optician in September of 2013. She's also a change agent for Transitions Optical and a writer for Covalent Careers.